Border stickers are a great and simple way to jazz up your scrapbooking layouts. But remember, you don't always have to use them as the manufacturer intended! This layout was created using Burgundy Bazzil cardstock, dark green cardstock, yellow cardstock, foam adhesive, white pen, Doodlebug Christmas Past Borders stickers and Provocraft White Alphabet stickers. 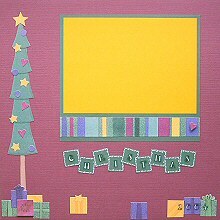 Begin this layout by matting your photo on yellow cardstock (I recommend using a 5x7 photo). Mat again on dark green cardstock, making sure you leave extra room at the bottom (approximately 4cm). Trim the stripe border sticker to fit and adhere under your photo. If you like, you can also add a heart sticker in the bottom right corner for added interest. I used foam adhesive to give a more three-dimensional feel, but you can stick it straight onto the border sticker if you wish. The next step is to create your side border. Begin by sticking your Christmas tree down the left side of your page. Make sure you leave enough room at the bottom for the presents. Decorate your tree using the stars, hearts and circles stickers. To create the pile of presents at the bottom of the tree, you will need to cut them from your presents border sticker. Select five of the presents and layer them on top of each other around the base of your tree. Remember, your burgundy coloured presents will blend into the background cardstock if you are not careful with your placement. When you are done, scatter your remaining presents along the bottom of the page. Keep three of them together on the right - you will be using them for your date later. Now, glue your matted photo into place, making sure you leave enough room underneath for your title. Next, cut nine small squares of green cardstock (one for each letter of the word Christmas). Use your white pen to draw a border around the edges of each one. Adhere a letter sticker to the middle of each tile to spell out your title. Arrange them a little haphazardly underneath your photo and glue down. Finally, use your number to stickers to 'write' the date on the row of three presents in the bottom right-hand corner. You now have a gorgeous layout for showing off one of your favourite Christmas photos!